Over the past two days, two new animated shorts have been released online as part of the new Star Wars Forces of Destiny initiative. Viewable on Disney’s YouTube channel, both of these first twoStar Wars Forces of Destiny‘s animated shorts run 2:48. 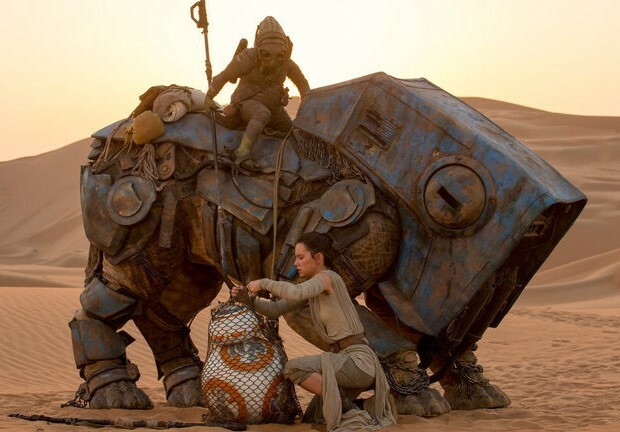 The first two show Rey escorting BB-8 while on Jakku, before bringing him to Niima Outpost in The Force Awakens, both of which seemingly answer unanswered questions. 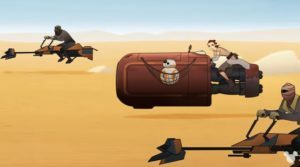 Released two days ago, the first of these shorts, “Sands of Jakku”, shows Rey walking BB-8 back to her AT-AT home, having rescued BB-8 from Teedo, as we saw in The Force Awakens. 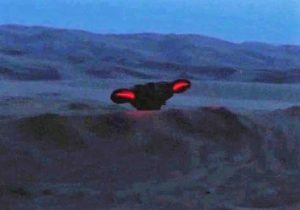 One curiosity I had when watching the movie is seeing a creature pop its head up in the sands of Jakku, yet we see nothing more about it – whether it is just simply part of the faunal landscape or maybe even a threat to them. It’s just there, as a creature, without any further appearance in the movie. 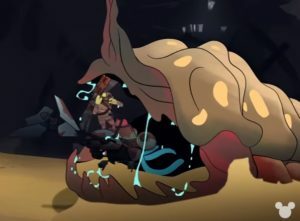 Once the nightwatcher worm catches up with them, it emerges from the sand to reveal a lot of its body, which is much larger than one might expect, based upon its head size! It tries to eat BB-8, with Rey initially slowing it down, but then spitting it out. Eventually, the nightwatcher worm catches up again and swallows BB-8. However, Rey uses her staff to get the nightwatcher worm to come up and spit BB-8 out. 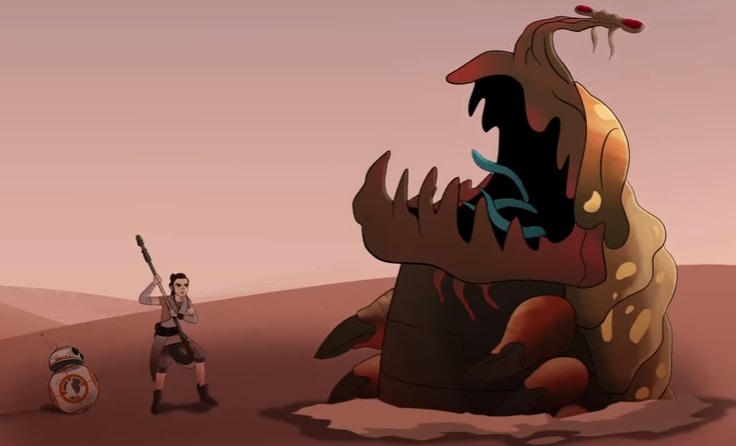 Rey and BB-8 then run to safety, reaching her sideways AT-AT home, then tossing the nightwatcher worm some scrap, saying, “I know you’re hungry – take this.” The nightwatcher worm, then turns around, although it’s unclear whether it is somewhat disappointed, not having been able to consume BB-8, or whether it is satisfied, having been given something to eat. Either way, its departure signifies the safety of Rey and BB-8 for the night. 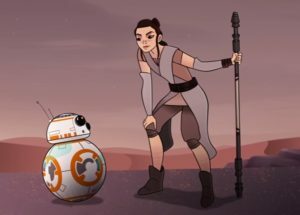 The second animated short in Star Wars Forces of Destiny, “BB-8 Bandits”, picks up the next morning, before Rey heads out with BB-8 to Niima Outpost. As she is preparing to head out on her speeder, with BB-8 already secure in the side netting, she notices Teedo looking at her over the ridge. I thought this was a nice inclusion, since, as a viewer of The Force Awakens, I had wondered if Teedo would be returning to retrieve BB-8 from her or not. From the movie, itself, it seems as if he is resigned to her having taken him from him. 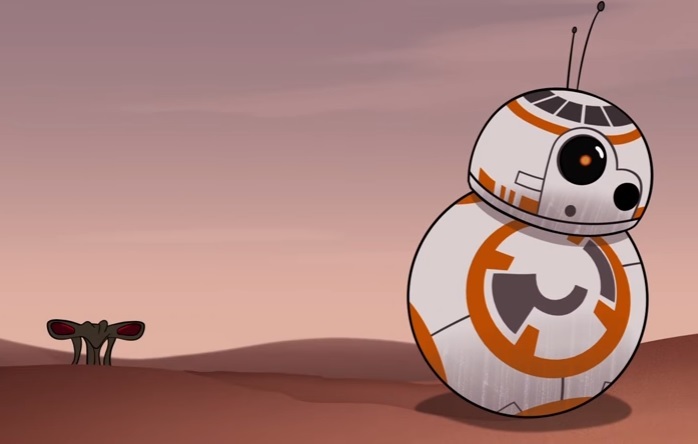 However, “BB-8 Bandits” shows that he was not simply willing to despair of getting BB-8 back. Teedo has come back, in “BB-8 Bandits”, although it’s unclear whether he is there to retrieve BB-8 or just to get back at Rey and not letting her get away with it, or both. Rey observes to BB-8, “Teedo – he’s come back, but I won’t let him get you.” However, this time, having been disappointed from the previous afternoon about his loss of this droid, he has returned with some thugs,* having known where she resides. 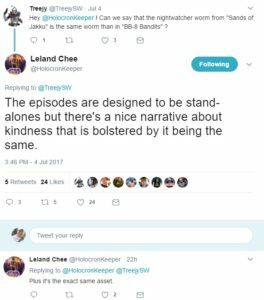 In both of these first two episodes, we get to see some interesting glimpses of Rey and BB-8 between her saving BB-8 from Teedo and bringing her to Niima Outpost. 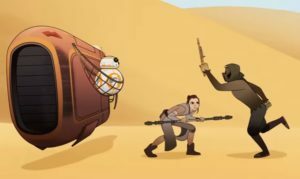 What we see in The Force Awakens shows this to be a section that was without conflict, these animated shorts show that there was actually some, and that Rey was able to successfully navigate them. They are pleasant, amusing, and enjoyable!